Life was full of promise when Tammy Whitworth and her husband Todd launched their first Window World franchise location in 1999 in Wilmington, North Carolina. They had a great partnership: she ran the office and installation crews and Todd handled the selling. In 2007, they bought the company from founder Leon Whitworth, Todd's father, and created Window World Cares, the brand's charitable arm. Everything was looking up. But the next year, the first of three misfortunes struck. In 2008, they went through the anxiety and stress of the premature birth of their first child. Two years later, Todd died unexpectedly at the age of 40. "I became a CEO overnight after the passing of my husband," says Whitworth today. "I was a mother of three children. So when I became CEO, leading this company was something that I felt very strongly that I had to do, that I wanted to do." Whitworth chose to carry on both personally and professionally and excelled at operating the company in the first years following her husband's death. Then she was diagnosed with breast cancer. She battled and defeated the disease. Whitworth could have allowed personal tragedy and adversity crush her, or she could choose to stare it down and use the hardships to make a difference in her world. Facing these struggles, she says, made her stronger and she has thrived at the helm of Window World. 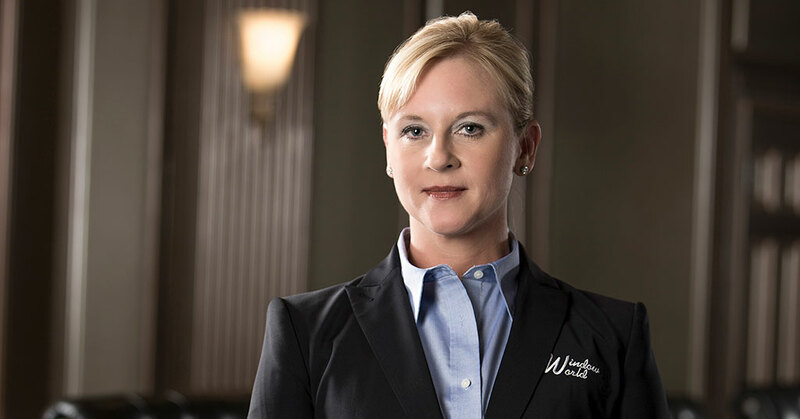 Under her leadership, Whitworth has moved the organization to a franchise model to create consistency within the Window World family, established world-class training for franchisees, and formed an advisory board. Despite the challenges, Whitworth's mission has remained focused on steering the company toward success, adhering to fundamentals, and keeping the core values of the brand and its family approach intact. Today more than 200 Window World locations are open across the country. Whitworth says the brand is now expanding westward and focusing on franchise growth and development in those markets. "As we continue to set the bar even higher in our industry, our focus will remain on offering the best products available, fostering our franchise locations, and taking care of customers at the highest level possible." It's not easily defined. I'm in the office three or four days a week, so I rely on our president and a very capable team of individuals to oversee the day-to-day activities. My responsibility is to focus on overall strategies and long-term goals and visions. I'm also committed to keeping the company in line with our core values and the Window World history of giving back. Very inclusive. I learned early on that I needed to surround myself with an intelligent and capable staff, which I have done. I make it a point to ask my team for opinions and advice, and I give their views careful consideration before I make the final decision. Being part of Window World from day one has inspired me to love this family. Seeing members of our company grow and progress through the ranks is inspiring. And it is their unyielding drive and commitment to bettering themselves and their communities that inspires my own leadership style. We have a great system of people within this company, and I need only look among them for inspiration in my own life. Home improvement is a male-dominated industry. And while many people may consider it odd to see a female CEO at the helm of the nation's largest exterior remodeling company, I consider that distinction to be an opportunity rather than a challenge. Again, I go back to that family atmosphere. When I'm in the office my door is always open. I don't want anyone to feel tense or guarded around me. Everyone in the corporate office knows they can ask questions and share their concerns with me. That mentality spreads throughout the entire system and is shared with our store owners and their teams. Furthermore, we make an effort to arrange trips outside of work for our entire staff. It is an excellent opportunity for store owners, office staff, and corporate employees to get to know one another better, and it helps break down the barriers that can spring up between the corporate office and our stores. an MBA school or OTJ? Regarding my own experience, I hit the ground running from day one. I've been with Window World since early on and actually started working in our Wilmington, North Carolina, store. So I've done nearly everything that could be asked of our general staff. While an MBA can certainly be of great value in the business world, there is something admirable to be said for learning about the business firsthand and working your way up the ladder one rung at a time. Our stores maintain a vast knowledge of the remodeling industry because many of our owners began their days in the business selling or installing windows. They know the business from front to back, and they know what it takes to create a memorable and rewarding experience for our customers. Respected--and I firmly believe that you have to earn respect. I became CEO overnight in 2010 after the passing of my husband Todd. We had purchased Window World, Inc. from his father Leon in 2007. I did not work at the corporate office at the time. I was president of Window World Cares, which is the charitable arm of the company, and I was a mother of three children. So when I became CEO, leading this company was something I felt very strongly that I had to do, that I wanted to do. But I also had the firm belief that while I deserved to be where I was and that it was the right thing for me to do, good leaders don't demand respect. They roll up their sleeves, work hard, and earn the respect they are given. I didn't grow up dreaming of being a CEO, but I would say the sky is the limit. If becoming a CEO is what you want to do, set your goals and work hard. I have a 16-year-old son who dreams of taking over my job one day. I tell him almost daily that he has to work his way up; he's not just going to walk in and be handed the title of CEO. He, like every other aspiring business leader, has to prove himself and work his way up through every aspect of the business. I don't ask anyone to do anything that I haven't done or am not willing to do myself. I also know that there are some things that I'm not capable of doing, or that other individuals may be better suited for. With that said, I think it's best to lead by example and not by command. Team management is a skill that you develop from listening to others, laying out clear expectations, and working with your employees. Leaders who know the importance of being a role model and creating clear channels of communication within their team. As a company, we make an effort to empower people to become leaders and managers. Internal growth is vital to our prolonged success, so when it comes time to fill a certain position we do our best to promote from within. They do a wonderful job of keeping me informed of the goals and timelines of their respective departments. With their day-to-day knowledge at my side, I can make informed decisions for the company. I rely greatly on them for that. Do you read management books? I do! One of my favorites has to be Good to Great by Jim Collins. Of course it's great to hear from a satisfied homeowner after we have completed an exterior remodeling job for them. But it's also personally moving for me when I see a store owner who uses the opportunity to make a difference in their community or family. I'm also incredibly proud of the way our company gives back. Window World Cares is partnered with St. Jude Children's Research Hospital, and it's wonderful to be able to make a difference in a child's life. We also proudly support the Veterans Airlift Command in providing transportation for wounded warriors and their families. Together, these heartwarming stories of children, employees, and veterans achieving a higher quality of life are what make my job so rewarding and meaningful. Are there any trends in the home repair/exterior remodeling industry that you foresee having an impact on Window World? Everything in our industry is evolving and becoming more digitally focused, so we're certainly making efforts to grow and meet our consumers in the digital marketplace. In terms of design trends, it is extremely important that we stay at the forefront of evolution. To keep up with the latest in home design, we've aligned ourselves with great manufacturers that work with us to offer our customers the latest and greatest in product aesthetics. We also have a strong product development team in the office that works to not only stay ahead of the trend, but to be the trendsetter in our industry. Typically, I like to exercise in the morning before taking the kids to school, or vice versa depending on the day. I'm usually in the office by 9 or so. And even though I'm not always at my desk, I'm always available. Wine with lunch? I do love to exercise in the mornings, but I rarely have enough time in the afternoon to enjoy wine with lunch. Absolutely! Whether it's coming to my house for a dinner or pool party or meeting for a fundraising event, I like to arrange things that get the office together as regularly as I can. Such events work wonders for breaking down the barriers that can arise among those who don't get to spend a lot of time working together. In my opinion, there's nothing better for getting to know a co-worker than sharing a story over the dinner table. I truly enjoy listening to the owners and staff outside of work as they talk about their families, their individual lives, or their needs from corporate. I'm currently reading Leading Women by Nancy D. O'Reilly that a co-worker lent to me, which I'm really enjoying. Three of my favorite authors are Paulo Coelho, John C. Maxwell, and Brené Brown. I absolutely love Brené Brown! I always take my phone. And depending on where I'm going, I'll either take my laptop or iPad and headphones. I struggle with finding that work/life balance. Often, if I'm with my kids, I feel I need to be at work. Conversely, if I'm at work, I will feel the need to be with my kids. All in all, I think I do manage it quite well. The kids understand that Window World is what provides for us and always has. To relax, I ride and show horses. When I get on a horse's back, I'm instantly transported to my happy place. It's about the only thing that I can do that completely clears my mind from distraction. My daughter got me into showing horses, and I grew up on a farm, so we always had them around. Once my daughter began taking horse riding lessons, I joined her to be able to understand the lingo and what they were doing and why. It was then that I fell in love with horses and started showing them myself. Now it's something we do together. It's very relaxing for me, and I've become a competitor too. My other children are boys, and they've realized that they're at a greater advantage when it comes to the male-to-female ratio. So, they're always willing to go! I like the mountains. Blowing Rock, North Carolina is close to home, and for a weekend destination I really enjoy that. As far as beach vacations, we recently took a trip to Turks and Caicos and really enjoyed that. I especially like the British Virgin Islands. Sailing around those crystal blue waters is certainly a treat. But if I had to choose between the mountains or the beach, I would take the mountains every single time. I prefer to send employees notes when something happens in their personal lives, rather than it having to do with business. I like to send notes that highlight big events in their lives such as a wedding or new baby, or if they get recognized for something at their church or in the community. I would have to say more of the same. We are America's largest exterior remodeler, and we continually strive to do things better than we did the day before. We want to expand product offerings, increase our national footprint, and continue to do everything necessary to deliver a remarkable customer experience. I think we've been very fortunate. When the economy is good, people buy new houses and remodel. But when the economy is bad, they tend to keep their homes and remodel what they have. So we're very fortunate in that we get to do business in both strong and weak economies. Of course in a recession there's less money to spend, but people tend to remodel rather than buy new homes. By the lives we've changed. Window World gives people the opportunity to own their own business and change their entire family's lives for the better. A major part of our success is also making a difference with a child, family, or veteran through our philanthropic partnerships with St. Jude and the Veterans Airlift Command. I'm a single mom of three children and each of them has turned out to be a pretty good kid. I'm very, very grateful for that. Trying to be a role model to those kids is a part of how I measure my success as a parent. I want to teach them that happiness and success are separate from financial well-being. And I want them to strive to make a difference in the world. In terms of my career, giving people the opportunity to own a successful business and enact change in their communities because of it is something I'm proud of. I don't have any major regrets. I think if we could all do things over again, we might do something different. But nothing major, no. We're into our third decade and coming up on 25 years in business. We've been corporate partners with St. Jude and Veterans Airlift Command for 10 years. We're extremely fortunate to be the number-one replacement window company and exterior remodeler in the country, and I think we can expect more of the same for the future. Right now, we're expanding our footprint out west and focusing on franchise growth and development in those markets.